Is your company facing a potential employer shared responsibility tax penalty under the Affordable Care Act (ACA)? If you have correctly calculated whether your company is or is not an “applicable large employer” (ALE), you have taken an important step in avoiding ACA penalties. The ACA requires ALEs—that is, companies that averaged 50 or more full-time equivalent employees (FTEs) during the previous calendar year—to offer health coverage to at least 95% of benefits-eligible employees or potentially pay a tax penalty. 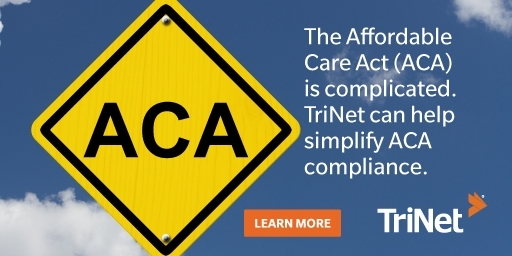 TriNet helps ALEs ensure compliance with this part of the ACA. In order to do so, we must know if your company is an ALE. That is why we have an annual ALE designation process. Important: Is your company a subsidiary of, or commonly owned by, other entities? For companies with shared ownership, ALE status is determined by using the FTE count of all companies within the controlled group combined. If the entire controlled group had 50 or more FTEs during the previous calendar year, ALL of the companies within the controlled group are ALEs, and will need to certify their ALE status independently. For more information about ALE designation for controlled groups and companies with shared ownership, see our ACA Fact Sheet. TriNet clients have an opportunity to designate as an ALE annually. Additionally, they have access to ALE calculators and support from ACA experts. Only you can certify if you are an ALE. So regardless of your company size or if you have certified your ALE status before, you should actively certify your designation each year. If you have already been asked to designate your ALE status for 2018 and did not do so (or you did not designate the ALE status for ALL of the companies you represent), contact your HR services provider to make this important update. Kim Abell is senior project manager, benefits compliance, for TriNet.